In a 3-quart saucepan, melt butter over medium heat. Add onion; cook until soft, stirring occasionally, about 8 minutes. Meanwhile, in a 2-quart microwaveable measuring cup or dish, cook milk in microwave on high about 9 minutes or until hot; cover to keep warm. Add sugar to onion; cook, stirring frequently, until light brown, about 7 minutes. 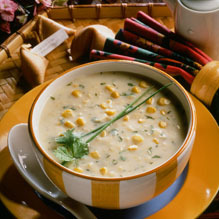 Set aside 1 cup corn; add remaining corn, broth, and pepper to onions; bring to boil. Add cornstarch mixture; cook and stir 2 minutes. Pour into food processor, in batches if necessary; process until almost smooth. Return to pan; add reserved corn, heated milk and cilantro. Cook over medium heat, stirring frequently, until heated through. Garnish with green onions if desired.